Collocations is an interactive work of experimental writing designed for tablet computers that appropriates two key texts from Niels Bohr and Albert Einstein's historic debates about the complementary relationship between position and momentum on the one hand, and determinacy and indeterminacy on the other. In Collocations, the tablet computer is that experimental apparatus. As the user moves the device, certain words from within Bohr and Einstein's original texts begin to vibrate, becoming highlighted and forming poetic subtexts. Striking a delicate balance between completely predetermined and randomly generated texts, these poems embody the fundamental indeterminacy of matter. In a domed whispering gallery, even the quietest sounds are carried from one end of the room to another: communication across great distance. Whispering Galleries delivers messages across time, helping a voice lost to history reach a contemporary audience. Visitors to Whispering Galleries see their own image reflected and distorted on a screen, and on its surface, a glowing text appears to float: an entry from an anonymous 1858 diary. 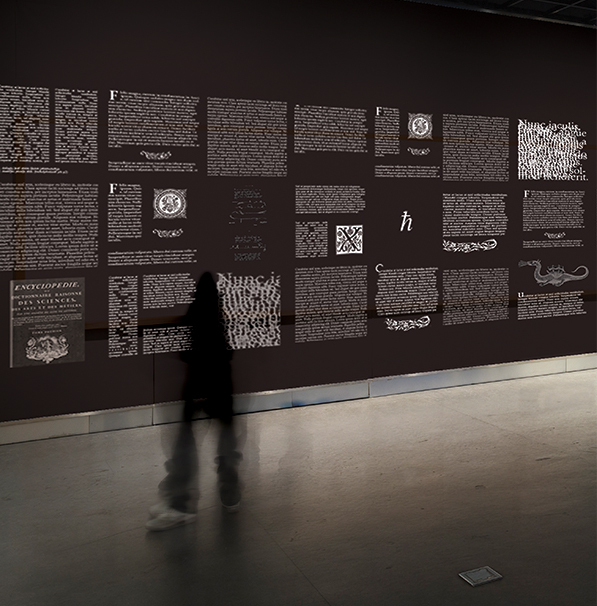 Visitors use their own hands to sweep the dust from his diary, gesturing over a Leap Motion controller, they scatter pixels from the text, leaving behind a web of whispers. The Reader's Project presents the work of a software entity that generates digital video montage, with visual content sourced through live image search. The Montage Reader analyses text and establishes an overall visual grammar based on closed-class words that underlie linguistic structure. The reader, then, searches for images corresponding to phrases, composing a sequence of images that corresponds with the written language of the text both structurally and also semantically--at least in so far as contemporary image search proposes a correspondence that is meaningful for the human user-readers of network services and their aggregation of crowd-sourced indexing. In 2012, if:book Australia created a project that took a book from concept to print within a single 24 hour period. The book was written and edited using an online platform where every edit made to the text was captured and stored in a database.Willow Patterns documents the complete output from that database. In its online component, Willow Patterns creates an API and searchable interface to the data, making every version of every story accessible and open to remix and response. 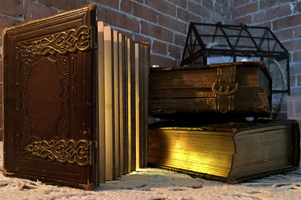 Its physical component is an export of the book's complete database published in a lavish 28-volume hardcover with a continuous spine design. Encyclopedia is an ecological installation featuring digital and sculptural content. The core of the work is a text generator that creates encyclopedic entries for extinct fictive animal species. These unique entries are given away as printed index cards to visitors of the exhibition. The work aims to put a gentle focus on the state of the planet, meanwhile exploring the possibilities of digital art. The text presentations of each species shift between matter-of-fact descriptions of habitat and feeding habits and more poetic sentences of the characteristics of the species and its surroundings. Networked Optimization is a series of three crowd-sourced versions of popular self-help books. Each book contains the full text that is, however, invisible because it is set in white on a white background. The only text that remains readable consists of the so-called "popular highlights"--the passages that were underlined by many Kindle users--together with the amount of highlighters. 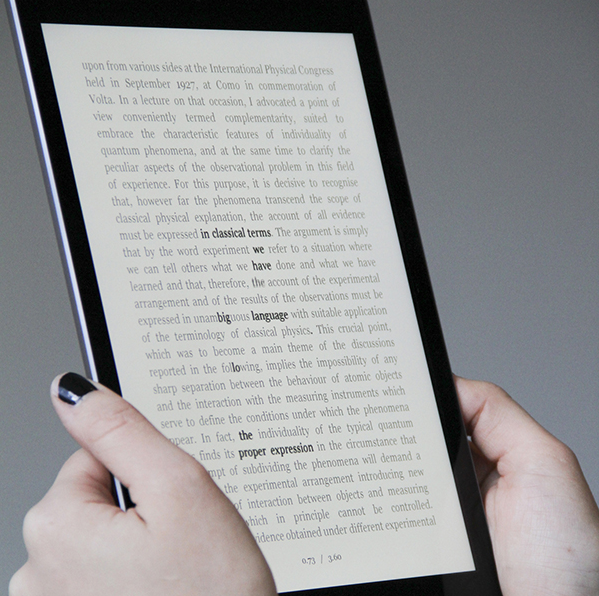 Each time a passage is underlined, it is automatically stored in Amazon's data centers. Among the books with the most popular highlights are a striking number of self-help books. Harvesting its customers' micro-labour, the act of reading becomes a data-mining process. 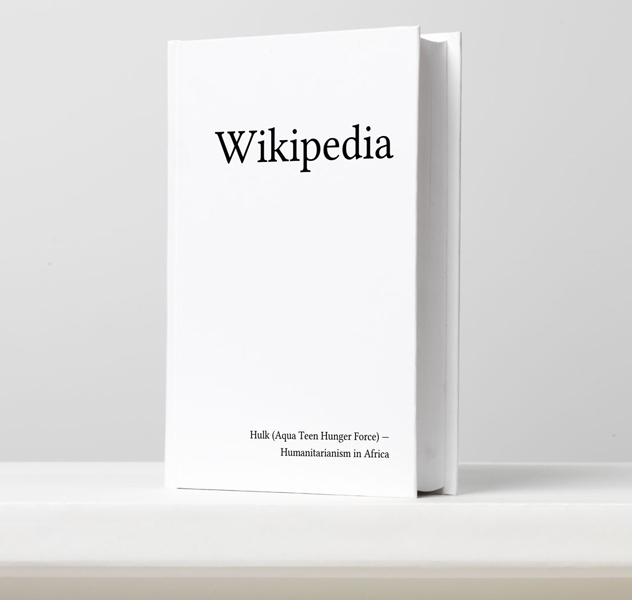 Print Wikipedia is an artwork in which software parses the entirety of the Wikipedia database and programmatically lays out a full set of over nearly 7500 volumes and, then, uploads these volumes to Lulu.com, a print-on-demand website. The installation displays a set of these printed volumes against a print of a schematic rendering of one bookshelf of volumes. This bookshelf will contain 150 volumes, or 2% of the whole set. 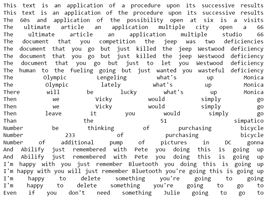 Entropic Texts is an experimental digital poem using text, image, and an interactive interface to explore the notion of entropy. Entropy is nature's tendency towards decay; thus, it is entropy that predicts the arrow of time and the length of the life of all things, living and material. As you scroll through this artwork, you are led into a world where the "force" of decay gets slowly stronger, to the point where text, images, and moving image, become glitched and decayed beyond recognition. 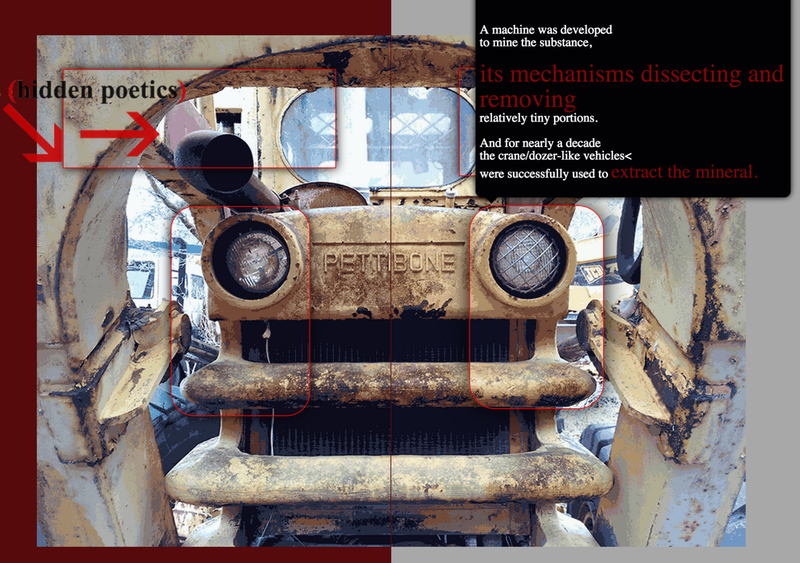 This imaginary world of quickening decay is represented by the junkyard. Death of an Alchemist is a novel written with data: a literary narrative generated in real time from online information. In the story, a present-day narrator logs onto the Internet to investigate the death of Johannes Trithemius, a German abbot and alchemist who died in 1516 and left behind a mysterious book, The Steganographia, containing hidden secrets of the universe disguised in code. The work consists of a wall of projected text and symbols generated by scraping a range of online data sources for news headlines, social media posts, gifs, memes and more. As the text updates with each new piece of data received, readers are invited to follow the clues to unravel the mystery and discover who killed Trithemius and why. Prey is an exploration in digital storytelling through the infusion of the old with the new, a hybrid grafting of the organic with the inorganic to create an entirely new form of codex. 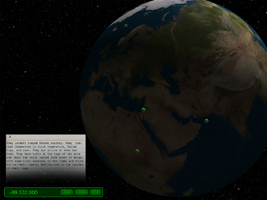 While the design is driven by an earthy handcrafted aesthetic, each novel hosts a unique system of interactive technologies. 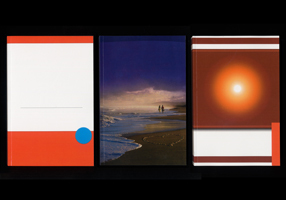 Upon first glance, they appear as a trilogy of standard vintage volumes. Once opened, readers will find their characters carefully embodied and thoroughly embedded within their pages. 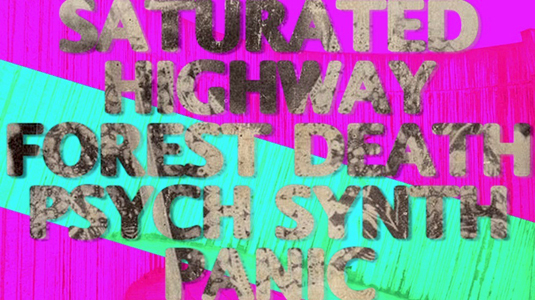 Saturated Highway Forest Death Psych Synth Panic (2015) is a 3-second pulse of metadata-composed collective musical intelligence composed by collecting and mixing all music tagged as "dark" as it passes across the artist's computer. It proposes itself as a new genre, approaching a collective generic distillation of TOTAL DARKNESS. 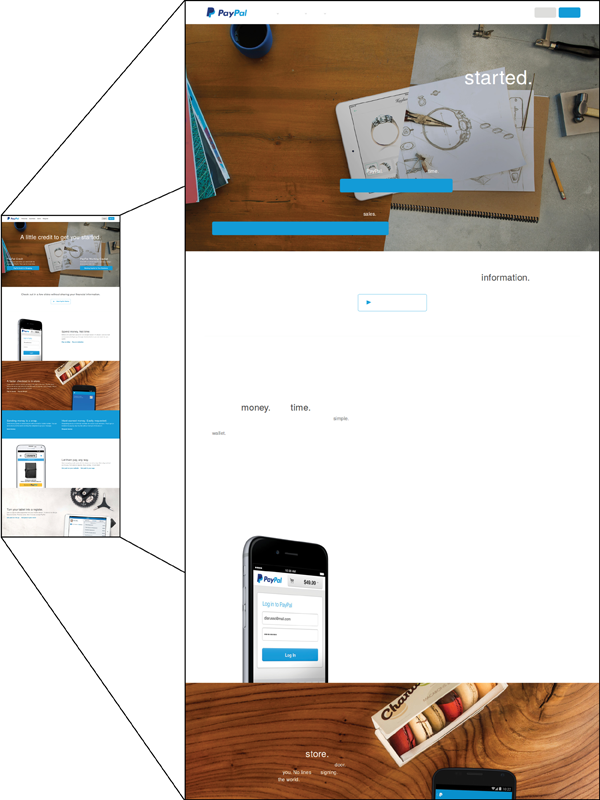 It is an ongoing composition that is re-tagged and re-shared, plugging back into the generic metadata system, the flashed image acting as a "label" for this new genre. Corporate music intelligence platform algorithms are put to work, producing something both filled with speculative hope and absurdly reductive, opening a core of panic within the data. 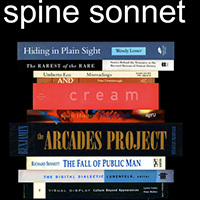 Spine Sonnet is an automatic poem generator in the tradition of found poetry that randomly composes 14 line sonnets derived from an archive of over 2500 art and architectural theory and criticism book titles. Each tap of the screen reveals a new poem.